Below is the February 2016 taster for http://www.Cityoffices.net – the sister leads provider to the market leading Metropolis Property Research. With the office construction sector booming in London (current survey work by Cityoffices shows the number of active London schemes to be nearly 100) there is a huge volume of tenders being sought and awarded as every role from architects, planners and engineers to service consultants, letting agents and acoustic consultants are being appointed on a daily basis. A full office deal analysis for January 2016, including details of a wide range of recent lettings. These are just a sample of the many office projects that Cityoffices reports on each month and backed up with full histories and contact names and numbers where available. No other information provider can match a fraction of Cityoffices’ coverage. Central London office lettings experienced a slow start to 2016 with only 787,000 sq ft of office space transacted in 32 deals in January 2016. The figure represented an almost halving of the strong December lettings total. January was characterised by 7 deals over 20,000 sq ft, including WeWork at Eastbourne Terrace, W2; Rathbone Bros at Finsbury Circus, EC2 and Office Group at 91 Wimpole Street, W1. Business services topped the table of lettings by sector, helped by WeWork’s 106,000 sq ft and Office Group, followed by financial services boosted by Rathbone Brothers. Healthcare and professional sectors are also performing well. Office deals under offer fell to just over 2.5m sq ft.
By area, the City accounted for only just over a 25pc of the floorspace let in January. In contrast the West End had a good month with over 50pc of space transacted. Current London office demand is calculated to be around 4.5m sq ft in the City and 4m sq ft in the West End. The volume of grade A (newly built or refurbished office space) let during the month reached 250,000 sq ft (32% of the total), as transactions for newly developed or refurbished space took a slightly smaller part of the total this month. Further details of schemes and pre-lets on Cityoffices.net. Metropolis is working on an upcoming report on office requirements in London and across the UK. A recent report by property consultant CBRE analyses trends in the legal sector of the office market outside London. Bristol firms occupy the most total legal office space, Manchester has the widest representation of firms in the Top 100; Bristol, Birmingham and Manchester all have over 750,000 sq ft of office space occupied by law firms. Metropolis is currently monitoring 40 law firm office identified requirements outside London, with a further 40 at an earlier stage. The Metropolis research team produced a total of 6,439 relocation, construction and refurbishment leads in 2015. 1,195 new office requirements were identified in total, accounting for 22m sq ft of demand from companies looking for new office space. 62% of Metropolis leads were projects located in the South of the UK, with 38% of lead projects located in Wales, the Midlands, North, North West, Yorkshire & Humberside, Scotland and Northern Ireland. 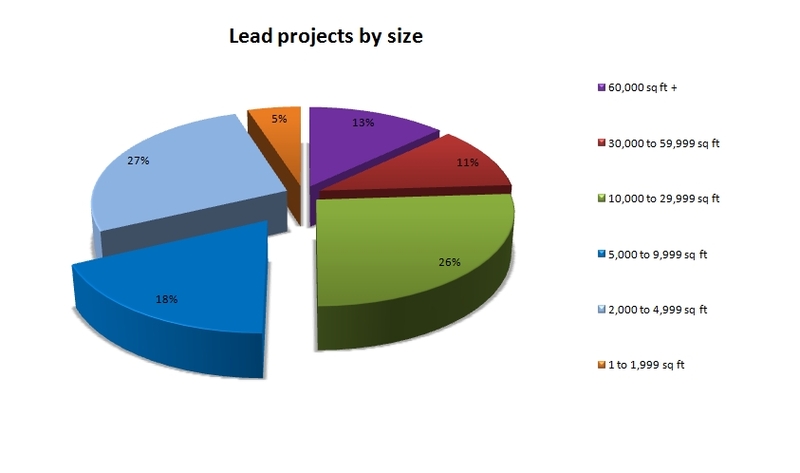 Greater London projects represented 44% of the 2015 lead total. In Greater London, Metropolis identified just over 16m sq ft of requirements for offices, with over 827 companies looking for new space. About 12.6m sq ft of this demand was for central London space. The top 5 most sought after postcode areas by demand were: EC2 (2.2m sq ft), W1 (2m sq ft), SW1 (1.7m sq ft), EC3 (1.3m sq ft) and E14 (1.2m sq ft). The number of leads in the South East (not including London) jumped by 22% when compared to 2014’s total. Over 150 office requirement leads were researched in the region in 2015, representing just over 3.5m sq ft of office demand. The largest office requirements centered on RG1 and SL1 postcodes, including several 9,290 sq m (100,000 sq ft) + requirements from energy, media, pharmaceutical and technology companies. Office relocation and refurbishment activity continued to be strong in the North West, particularly between 186 sq m (2,000 sq ft) and 929 sq m (10,000 sq ft) projects. Just over 2m sq ft of office demand was identified in the region, the largest requirements centered on the Greater Manchester area. About 60 Manchester companies were linked with searches for new space, around 1.5m sq ft of office demand. 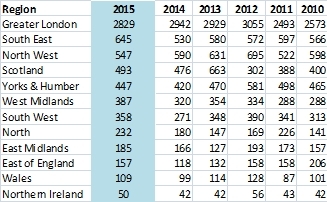 Leads numbers in Scotland were slightly up on 2014’s result (3.5% up). The region remains the UK’s 4th most active in terms of the number of Metropolis lead projects researched, but 3rd in terms of total office demand. Metropolis identified 2.1m sq ft of office demand in Scotland as a whole in 2015, 1m sq ft of which was demand for Edinburgh space and 0.8m sq ft of which was demand for space in Glasgow. Some of the largest requirements came from the banking and finance sector, which were mainly centered on Glasgow. The largest requirements for Edinburgh space came from the accountancy, law and technology sectors. In Yorkshire and Humberside, just over 1m sq ft of office requirements were identified, with 115 companies looking for new space. Demand for new space in Leeds accounted for 0.8m sq ft.
West Midlands lead numbers were up 21% on the 2014 total. Just over 1m sq ft of office demand was identified in the region, 0.7m sq ft in Birmingham. About 180,000 sq ft of office demand was identified in Coventry, boosted by a 100,000 sq ft requirement from an energy company. In the South West, just over 0.5m sq ft of new office demand was identified. Bristol was the preferred location in the South West for large insurance and law sector moves. Lead numbers in the North increased significantly for the second year running, up 29% on 2014. About 0.6m sq ft of office demand was identified in the region, 0.2m sq ft in Newcastle. Lead numbers in East Midlands were slightly up on the five year average. The largest requirements mainly came from the manufacturing and retail sectors looking for distribution space with offices. East of England lead numbers were up 33% on 2015’s total. 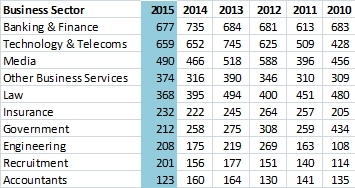 The top five office requirements by size came from technology, pharmaceutical, accountancy and law sector companies. Office demand tracked in Cambridge reached 0.4m sq ft. The largest office requirements in Wales came from the Public sector, with a 130,000 sq ft requirement from a government department looking in Cardiff. However there were also two 100,000 sq ft requirements from law and insurance firms also looking in Cardiff, where total office demand was just over 0.5m sq ft. The largest office requirements unsurprisingly came from Belfast occupiers, with government, accountancy and technology sectors the most active. 50% of Metropolis leads in 2015 reported on projects over 10,000 sq ft. 44% of leads were made up of projects between 5,000 sq ft and 30,000 sq ft. 68% of leads covered projects over 5,000 sq ft. The increase in lead projects between 2,000 and 5,000 sq ft was significantly influenced by added investment into regional research by Metropolis, particularly in the South East, West Midlands and South West. A significant number of new office mover leads, typically 20 to 50 staff relocations, were identified in these areas in 2015. The 40 and 50 redevelopment schemes in London that effected existing tenants in 2015 also contributed to an increase in the proportion of these lead projects. These schemes, which include demolition and refurbishment of existing buildings, forced hundreds of SME office occupiers to find new space, the significant proportion of which occupied between 1,000 and 5,000 sq ft. The Banking & Finance Sector just edged ahead of Technology & Telecoms leads in 2015 and was the most active UK business sector in terms of relocation and refurbishment projects. Lead numbers fell by 8.5% when compared to 2014’s strong result, but were still about equal to the five year average. The largest requirements in this sector were focused on space in Docklands and London EC2. The largest office lettings were on space in London EC4 and EC2. Office demand from the technology and telecoms sector was just over 3m sq ft. Two of the top five largest requirements for new space from the T&T sector came from social media companies, both seeking in excess of 100,000 sq ft of space in the West End of London. The majority of requirements for new space over 50,000 sq ft centered on London, but there were notable exceptions, including a 150,000 sq ft requirement for space in Cambridge from a US Software firm and a 100,000 sq ft requirement for offices in Warrington from a US computer manufacturer. Office demand from media sector companies, often grouped with Technology and Telecoms under the banner “TMT”, reached 2.5m sq ft.
Central London, particularly SW1, W1 and WC2, was the overwhelmingly preferred location for this sector. The largest media requirement outside of London came from a media broadcaster looking for 150,000 sq ft in the Thames Valley. Demand for new space in the law sector focused on London EC2, with three 200,000 sq ft + requirements for new space in this postcode. Outside of London, the largest office requirements centered on Manchester and Birmingham.